All the reports suggest Eskom needs R50-100bn over the next five years. That’s almost R2000 for every man, woman and child in South Africa! Eskom’s going to get that by raising prices! For those of you who buy your electricity directly from Eskom, you’ve already had an increase back in March; the rest of us will get a similar increase from our municipality in July (more details coming soon!). But with Eskom in financial trouble, it wouldn’t surprise anyone if next year’s rise will be much bigger. Some experts think next year’s rise will be back up to 14%, but Eskom are likely to ask for 16% again. So what? – 8%, 16% — doesn’t seem that much does it. 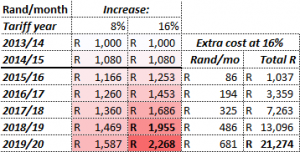 If you spend R1000 each month now you’ll pay R80 more next year (R1080 vs. R1160)? But it keeps going up, every year and so in 5 years’ time that small increase amounts to a lot. The same electricity will cost you almost R1,600 if the price goes up by 8% – like NERSA’s recommendation. And, if Eskom get their way and prices increase by 16% each year, that same electricity will cost over R2,268! Adding all of these extras over these five years you’ll end up paying R21,274 more in total. Now that’s a lot, right! There’s a big difference between 8% and 16% price rises! So what can you do? Well first thing is to make sure anyone you know at Nersa or Eskom, in the press and in politics understands the difference between 8% and 16%… it’s not R8, it’s not R80 or R800 it’s more than R21,000. A simple shortcut is to take your current monthly bill – and times it by 21… that’s how much extra 16% is than 8% over the next 5 year. If you don’t have any friends in high places, you could try cutting your usage. Fortunately the inclining block tariff is on your side – you can counteract this years 8% price rise by cutting your use by just 5%. That’s not really too hard, at Homebug we find that just cutting back on waste you can easily save 10%; so that would cover you for two years of price rises. With a bit more thought and some small investments (e.g. LED lights or a geyser blanket), we find people can easily save a quarter of their bill. This is enough to beat 5 years of 8% price rises – so you’ll be paying pretty much the same this year as you will in 2018! The days are gone when South Africans could afford to leave their geysers on all day and night. We are in a new era and we must learn to spend electricity according to a fresh set of rules. It will not only be more expensive, it will also be more complicated. Homebug helps you keep on top of all this and gives you information about your actual usage and where you can make savings. This knowledge equips you to beat Eskom at its game and drive your electricity costs not up but down. Take the guesswork out of the puzzle. Turn the Eskom challenge into a game you can win.